Product descriptions were introduced in response to producers' need to optimise their exchanges of product information with the mass-market retail chains. The dual aim was to reduce the administrative costs of maintaining product databases and to optimize processes with partners to avoid errors and disputes. What is the GS1 product description? "This is an electronic message in which a product manufacturer provides partners with all the information relating to the product. The list of properties making up the description is invariable and is governed by the GS1 standard." "GDSN® is a network offering a single point of entry for the synchronization of product descriptions. For the manufacturer, it means "publish once, circulate to all", and for the distributor "subscribe once, receive from all." What is an electronic catalog? "Electronic catalogues or e-catalogues, communication-enabled thanks to GS1/GDSN (Global Data Synchronization Network) international certification, allow suppliers and their partners to exchange product descriptions in real time. This guarantees that product information is the most recent available." TX2 WEBCAT gives you secure access, 24/7, to our 100% online application. 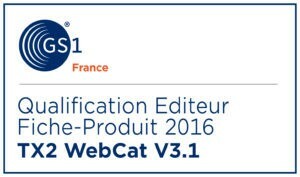 All data input are checked, transmitted, backed up and archived on our TX2 WEBCAT platform, which is INCO (EU Regulation 1169/2011) certified. Ability to interface with all chains connected to GDSN. Possibility of exporting data in Excel, the format expected by all chains not connected to GDSN. We provide you with support by e-mail and/or phone, in response to all your issues.